Russian Prime Minister Vladimir Putin has bowed to the main shrine of the Russian Orthodox Church Outside Russia (ROCOR) the Kursk Root Icon of the Mother of God. The icon was brought into Russia on September 12 for worship. It will remain in the Cathedral of Christ the Savior until Wednesday, after which Patriarch Kirill of Moscow and All Russia will take the icon to Kursk, where the icon was first appropriated. 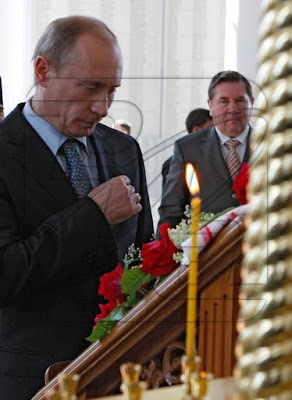 When Putin entered the cathedral, representatives of the Russian Orthodox Church Outside Russia sang troparion. Putin kissed the icon and came up to the representatives of the Russian Church Abroad. After welcoming them, the prime minister recalled that some of the representatives of the ROCOR present in the cathedral had participated in the union of the Russian Orthodox Church in Russia and the Russian Orthodox Church Outside Russia. "It was the right decision, and your visit now is the best evidence of that. I would like to welcome you as guests, but then I realized it would be wrong. You are home," Putin said. In response, Metropolitan Hilarion, first hierarch of the ROCOR, thanked Putin for "assisting with the organization of the arrival of this icon to Russia."